Enter the amount of donation. 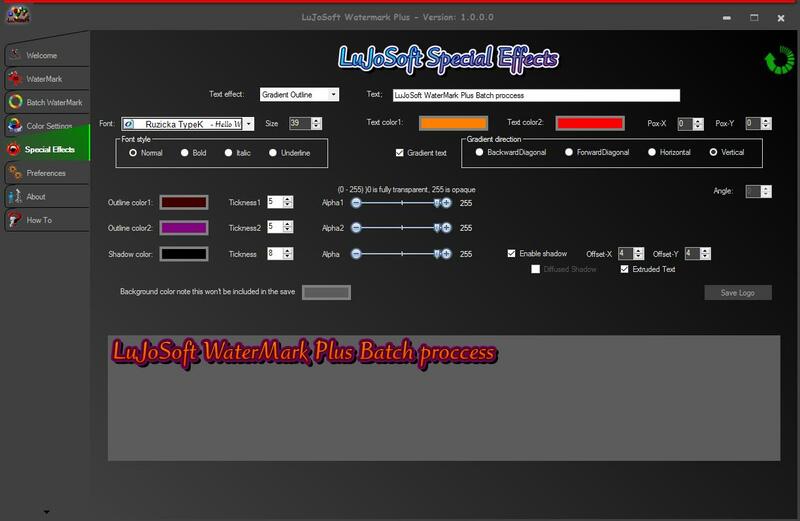 This is the main program where you apply your watermark on any picture or image you want, after making your setting and import on the other tabs. After opening an image and made your setting just click on the image anywhere you want to apply it. If you dont like your choice just click again to move it where you want. 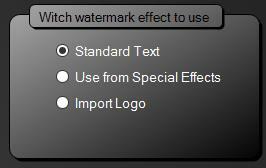 This is the text box where you enter the text for to show as a watermark, if you choose to do a standard text watermark. "Standard text" The one to use if you want a plain text watermark in the color and opacity you want made in the color setting tab. 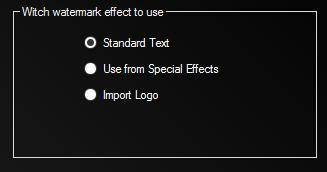 "Use from Special Effects" The one to use if you choose to use the one you created in the Special Effects tab. "Import Logo" Click on this one to import any image to be applied as a watermark. Choose a destination to save, by default it will save in the same folder, but you can change it by clicking the button. Choose the image format you want to save to. If you want to use a prefix make sure that the checkbox is selected, also enter the prefix of your choice. :P The button to save the watermark image. This does the same as the Watermark tab but with as many images or pictures in one click. To open pictures or images you have to choices open by file(s) or open by folder. If you want to preview what the watermark will look like, just click any filename you want and you will see the real preview of the finish job. Also notice at the bottom that you have the check all uncheck all and clear list link. Filenames must be checked to be process. The location you want the watermark to be print on. Click the save button and in a few seconds all will be done. 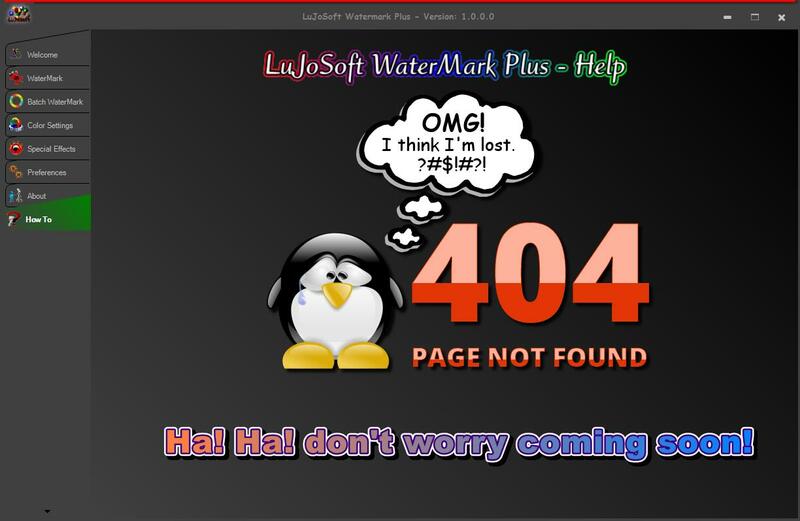 Not much to explain on this one, select your font, size, color and opacity of the watermark. 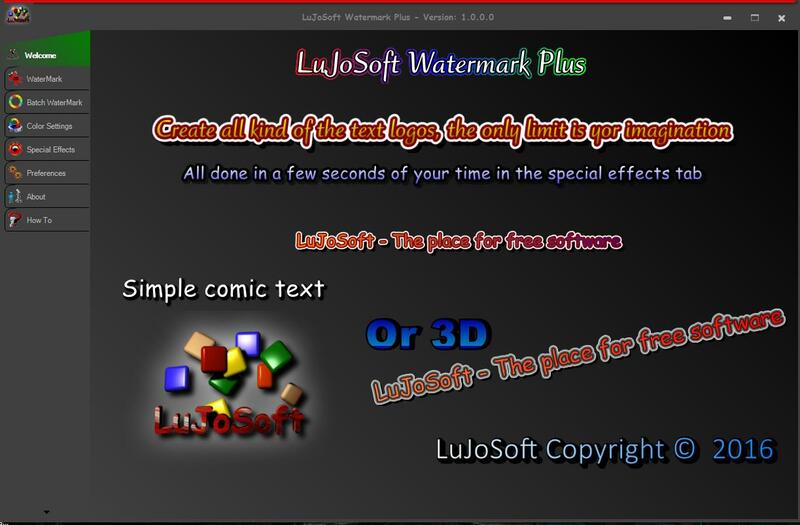 You can also test in the bottom your text watermark to see if you like the font and color. 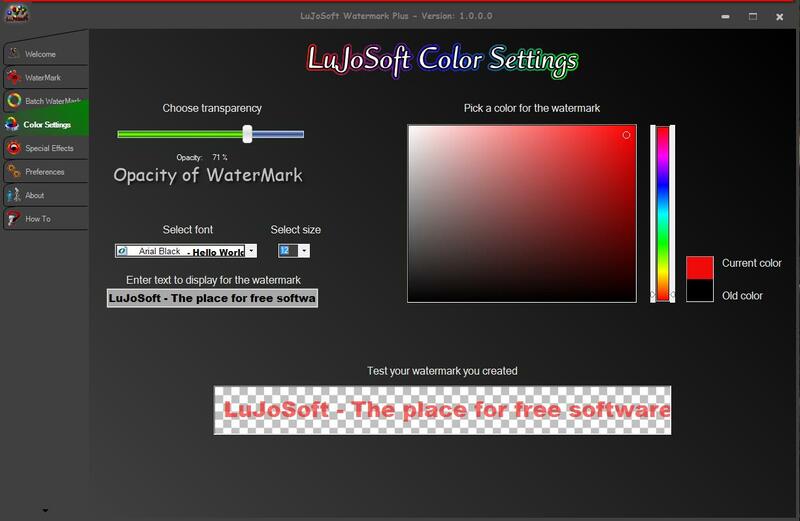 This is where you will be able to create special logo text. There is so many possibility and that's why I said earlier that only your imagination will limit you. 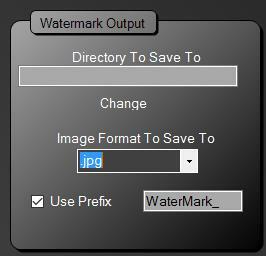 After creation you can directly go to the watermark tab and start using your new logo or you can save it for other day use. Text effects: choose a predefined template to get you started. Text: The text that will be use for the logo. Choose your font style, size and family. Textcolor1: Main color for the text. PosX and PosY: location, you really don't need to use that. The direction of the gradient you want to use. Color outline 1 and 2: Color of the outlines. Outline thickness 1 and 2: The thickness of the outline. Outline alpha 1 and 2: The transparency of the outlines. Color Shadow: Color of the shadow to use. Shadow alpha: The transparency of the shadow. Enable shadow: Shadow enable or not. OffsetX and Y: size of the shadow. Extrude: Very dark shadow, no transparency preset. Diffuse: Very soft shadow preset. Background color: This is only for you to see how the logo looks in that background color, the background color wont be use in the save logo all logo have a transparent background. Save your logo to file for future use. Viewer to see the output of your creation. This tab is for you to adjust your personal preference, you can hide tab that you don't need, put the tab on the left side and more. Choose tab that you want to see or not, checked mean on. 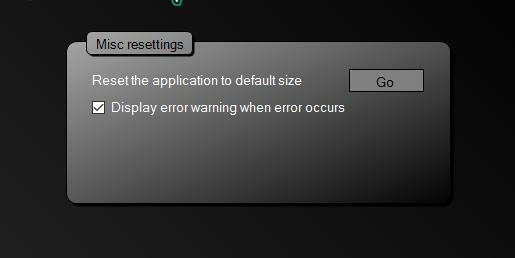 Will let you know if an error happen with the program, small tool for me to spot bugs. Important that you leave it on. Line up tab in multiple line, don't really need that for now. 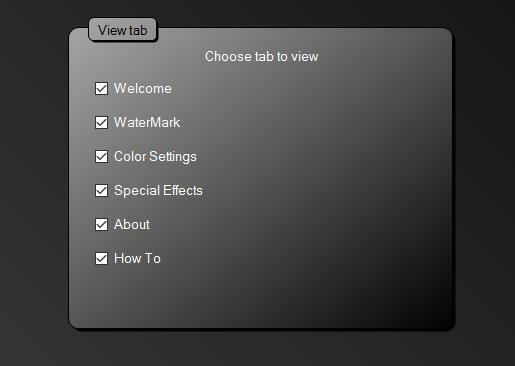 Position the tab on top or left, checked = left. To check if the program as encounter errors, if yes this next image will be displaied. From here you can delete the report or click the send button so I can fix these little bugs. This will reset all your settings to original installation, and program will restart. 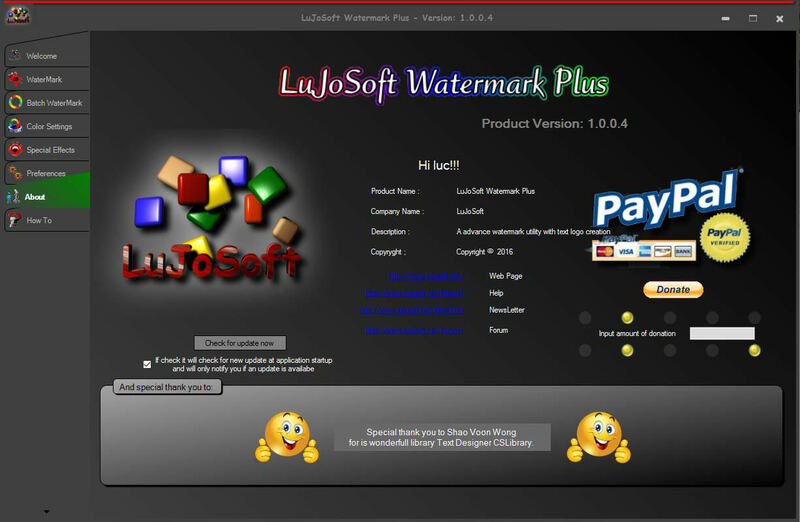 Info about the software, also you can donate within this page. You can check for update manually or put in on auto update. This help info page, note you will see this image only if your offline.